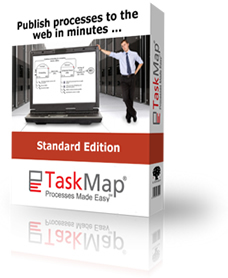 TaskMap® Business Process Mapping Software has been designed to meet the growing demand for a simple,affordable way to document and implement processes. Other business process mapping tools are too complicated and disorganized to present enough detail to properly convey every step of a process. Process maps created with TaskMap allow for details regarding individual Tasks (Responsible Roles, Guidelines, Resources, Time, Sub-processes, etc) to be presented on every Task in a neat and organized manner. TaskMap makes documenting your business processes so simple, anyone can do it. This enables process owners to document their own processes, putting the power of change in the hands of the real expert. After all, who knows the job better than the person who actually performs it. All our software products are backed with our RISK FREE 30 day money back guarantee. See why thousands are standardizing on our Visio-based application and training courses. Volume discounts start at 25 or more licenses. Email for details. The software will download automatically when your order is complete. You may install and activate the software on a single computer for a single user.